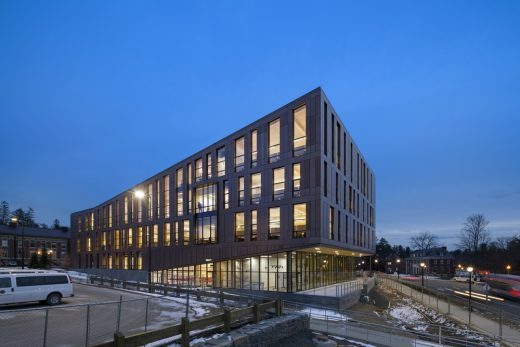 Leers Weinzapfel Associates recently completed the Design Building at the University of Massachusetts Amherst, the first Cross Laminated Timber (CLT) academic building in the US and the largest installation of wood concrete composites in North America. 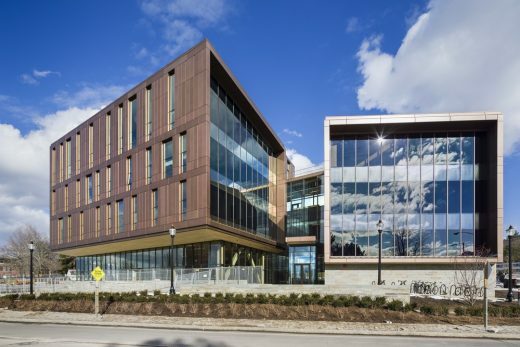 The $52M, 87,500-square-foot project, made possible through supplemental funding from the Massachusetts State Legislature, is a dynamic space of exchange, collaboration, and experiment. 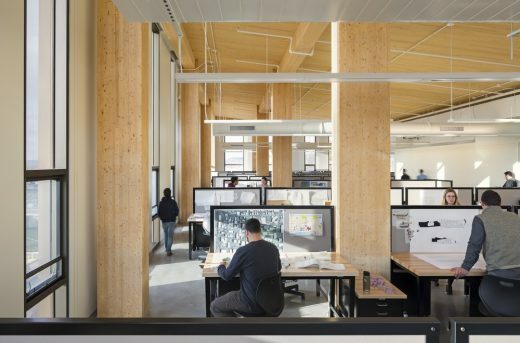 Uniting the university’s departments of Architecture, Landscape Architecture and Regional Planning, and the Building and Construction Technology program under one roof for the first time, the structure itself is a teaching tool for prescient sustainable design. 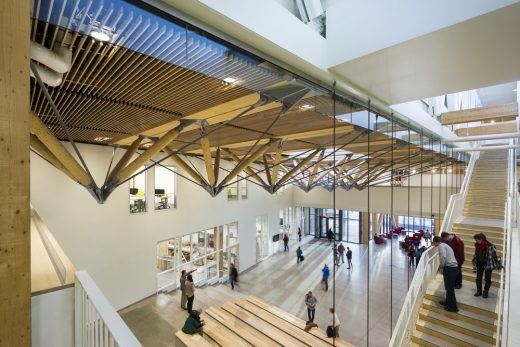 The building is organized around a skylit central commons that brings students together for lectures, exhibits, presentations, and informal gatherings. Studios, maker spaces and classrooms surround the central space that opens onto the street as a showcase for the design disciplines. The commons is capped by a green roof that comprises an outdoor learning environment and experimental space for the landscape department. 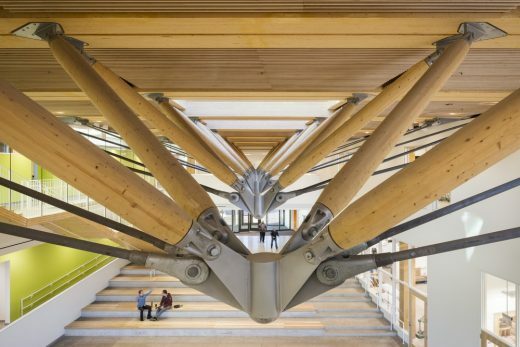 A demonstration of the construction process itself, columns and beams of glue-laminated wood, a floor of composite, exposed cross laminated timber plank and cast in place concrete, and the lobby’s “zipper truss” (developed in consultation with Equilibrium Consulting) all exemplify innovative timber engineering. 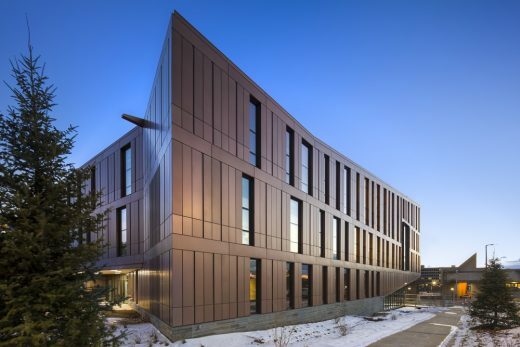 The building’s highly-efficient envelope of copper-colored, anodized aluminum panels and vertical windows suggests the colors and patterns of the region’s forests and trees. Surrounding landscaping by Stephen Stimpson Associates makes extensive use of native plants and paving materials. Dedicated mechanical equipment is zoned for optimal efficiency, and extensive glazing and skylights provide maximum daylight to the building’s interior, reducing the need for artificial lighting. Storm water management directs roof runoff to a “spring source” at the top of the site, filtering the water through bio-swales and timber dams to the site’s lower end and back to the Connecticut River. 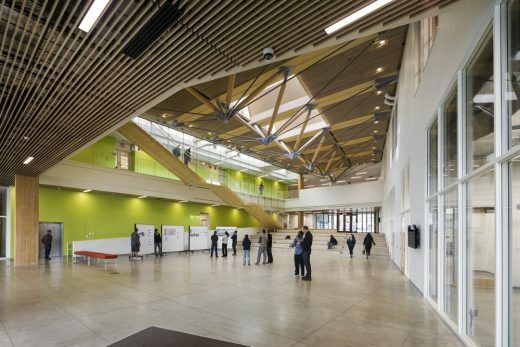 Suffolk was construction manager for the project, which is targeting LEED Gold certification. 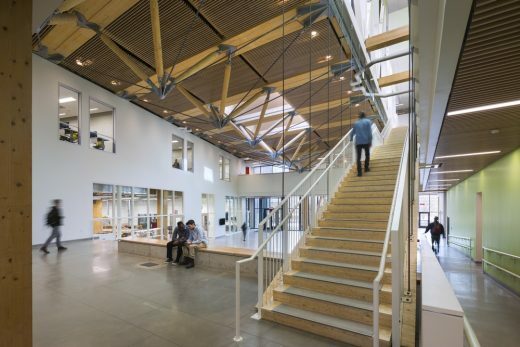 Our firm’s work lies at the intersection of architecture, urban design, and infrastructure. Recognized for our inventiveness in dramatically complex commissions, we meet these challenges with uncommon design clarity, elegance, and refinement. Widely recognized with over 90 national and regional awards, our work has been published worldwide and exhibited nationwide. In 2007, the American Institute of Architects honored us with the Firm Award, the highest distinction it bestows on an architecture practice. 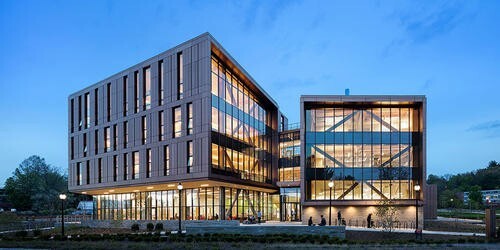 The goal of the Design Building was to create an environment of collaborative research and teaching, to integrate the building with its landscape and campus, and to celebrate a shared commitment to sustainability. The creation of a common center where students and faculty gather for organized and informal activity and can look between studios and shops is key to the university’s collaborative goals. 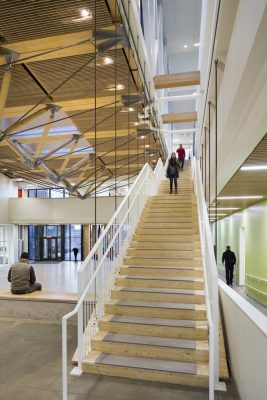 Bringing together the previously dispersed departments of Landscape Architecture, Architecture and Building Construction Technology programs, the new Design Building occupies a pivotal site on a campus in rural western Massachusetts. It is a dynamic space of exchange, collaboration, and experiment.